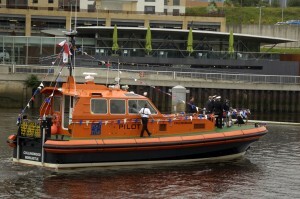 On 5th August 2008 in a Champagne Reception at Newcastle Quayside the Port of Tyne officially launched their brand new pilot boat. The new boat was christened Collingwood by Mrs Susan Collingwood-Cameron, a direct descendent of Lord Admiral Collingwood who expressed her delight at having been asked to launch the Collingwood. It is a special honour. Triton – Millie age 6 “He is God of the water”. The Zooming Cutter Rules – Hannah age 10, “Because it will go fast and rule all the other boats”. Little Neptune – Erin age 8 “Even if he is a little boat he is still King of the Tyne”. 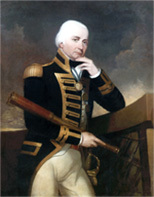 In spite of the judging being extremely difficult, Brian Reeve, the Port’s Chief Technical Officer said “There was one name that struck a cord and all the judges felt that Collingwood, after Admiral Lord Collingwood, was a great name, not only was he born in Newcastle but he led the command and victory in the Battle of Trafalgar”. Twelve entries submitted Collingwood including Sophie age 6 from South Ridge First School who said “He was a very important man”. Other winning entrants came from East Boldon Juniors, Riverside Primary and St James Primary. The Port of Tyne is the principal port of refuge on the east coast and the port’s pilot launches are essential in maintaining the prosperity of the river. They need to be all-weather boats capable of going to sea and boarding and landing Pilots in any conditions. Reliability of the port’s two pilot launches and survey/pilot boat is paramount and our maintenance engineers are all involved in the upkeep and repair. The Collingwood’s revolutionary aluminium hull is the first example of its kind in the UK was designed and built by Pembroke Dock-based Mustang Marine. However around the world there are a large number of port authorities that have been operating Camarc-designed aluminium pilot boats for a great number of years including the Dutch Pilots and New York Pilots. All Camarc pilot boats share the same general type of hull form whether constructed of steel, aluminium or glass reinforced plastic, GRP. The sharply angled hull gives a finer entry than conventional hulls whilst retaining the roll stability and the combined result is a fast vessel with an excellent ability to manoeuvre at sea. The Port of Tyne’s investment of over £750k means that the new 16 metre vessel has been designed with durability in mind. The hull, deck and superstructure are fabricated throughout using marine grade aluminium alloy, the central helm position is arranged with all controls, instrumentation and navcomms ergonomically close to hand. The coxswain and boatman both enjoy suspension seats, three of which are also fitted for pilots. 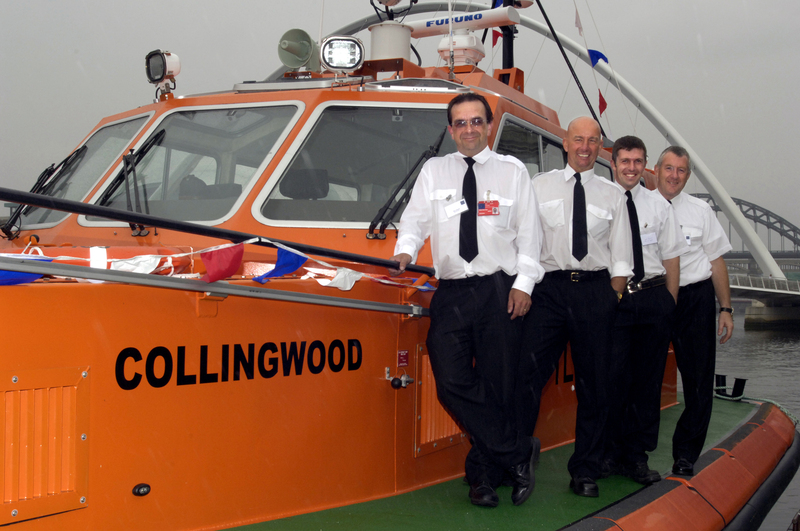 Collingwood is also fitted with radar, satellite compass, GPS sensor, AIS (automated identification system) a digital network echosounder and two sailor 5022 VHF DSC radios. Powered by Scania engines, the boat has a top speed at sea of 22 knots. Mrs Collingwood-Cameron ‘pushed the boat out’ in the time-honoured manner of smashing champagne against the bow followed by a prayer from Paul Shone, the Superintendent of the Fisherman’s Mission, who has since retired, to protect all that sail in her. 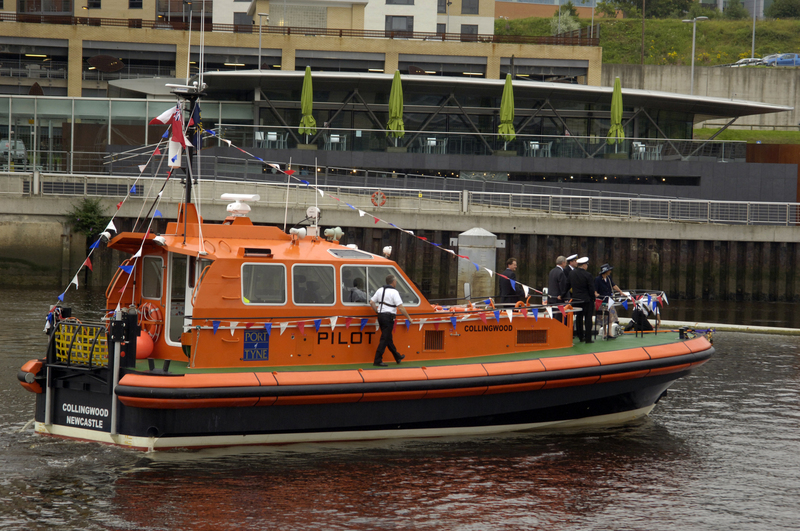 Afterwards, there was a reception at the Pitcher & Piano at Newcastle quayside for all who work closely with the pilot cutters and marine department. Mike Nicholson, Harbour Master, stated that the Collingwood would complement the Port’s existing pilot boat and survey launch to become the preferred all weather vessel.